Head coach Jeff Jones and the Old Dominion men’s basketball program for the upcoming 2018-19 season. The schedule entails 17 home games, at least eight opponents that won 20 or more games in 2017-18, at least five opponents that participated in postseason play a season ago and showdowns against five in-state schools. The 2018-19 slate is headlined by road games at Syracuse, Saint Joseph’s, Richmond and the Paradise Jam, as well as home games against VCU, Northern Iowa, William & Mary and James Madison. The clash against Syracuse on Saturday, Dec. 15 will mark the fourth all-time meeting between the two schools. Jim Boeheim led the Orange to the Sweet 16 a season ago. The Monarchs will take on Oregon State in the First Round of the 2018 Paradise Jam on Friday, Nov. 16. ODU will then square off against either Missouri or Kennesaw State in the U.S. Virginia Islands. Old Dominion will play 18 conference games, with the last four being part of Conference USA’s new innovative schedule, which entails a pod system format. Within the format, the 14 programs will play each other once and their travel partner twice in the first seven weeks of the conference season. At the conclusion of the seven weeks, teams will be placed in one of three groups based on conference standings through the first 14 games of league action. The teams will be divided into two groups of five (1-5 and 6-10) and a group of four (11-14). During the final three weeks, teams will play within their respective grouping for the last four games of conference play. Home and away games within the groups will be determined by a preset formula. Once all 18 games have been completed, the top 12 teams based on final league standings will be seeded for the conference tournament. Teams will be guaranteed seeding within their respective group. For example, if a program lands in the second group (6-10), it will seed no higher than six and no lower than 10 in the tournament field. “I think it’s creative and I’m happy that Conference USA is being proactive in trying to do something new,” said Jones. “Every year we’ve had at least five really good teams and yet people nationally, and even people that support Conference USA, don’t clearly understand how good those five or six teams have been. It’s a creative, aggressive, forward-thinking way to help the league, particularly the teams at the top." The 2019 C-USA Basketball Championships will be held in Frisco, Texas, March 13-16, at Ford Center at The Star. 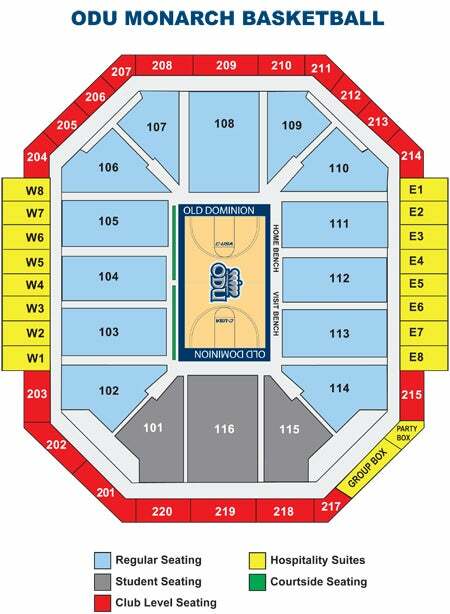 Enjoy the Old Dominion Monarchs and Lady Monarchs basketball seasons as a group, live at the Ted Constant Convocation Center! Get your friends, family members, business associates or your congregation and enjoy a fun, memorable group outing at an ODU game. Looking to enhance your group experience? From pre-game to halftime, we’ve got you covered. Some options for your group include National Anthem performance, Halftime performance, Court of Dreams with 45 minutes of court time before or after the game, and Kids High Five Tunnel. See more information HERE. Pick the package that’s right for you and bring your group to the Ted! To reserve your group tickets, please contact Todd McKeating at (757) 683-7087. Old Dominion University students are admitted free to all Old Dominion University athletic events. Click here for student ticket policies for athletic events and to register.